Tag line: "The one that started it all"
Produced by Walt Disney, Snow White and the Seven Dwarfs was the first feature-length animated motion picture ever made. The beautiful princess, Snow White (voiced by Adriana Caselotti), lives with her wicked stepmother, the Queen (Lucille La Verne), who, fearing the young girls beauty may someday surpass her own, forces Snow White to work as a lowly servant. Alas, the queen’s worst fears come true when her talking magic mirror (Moroni Olsen) announces that Snow White is the fairest in the land. In a fit of rage, the jealous queen hires a huntsman (Stuart Buchanan) to kill Snow White, yet he can’t bring himself to do it, and instead warns the girl that she must leave the kingdom and never return. With nowhere to go, the princess puts her faith in the animals of the forest, who guide her to a small cottage owned by seven dwarfs, all of whom spend their days working in the mines. Convinced their home is in dire need of a woman’s touch, the dwarfs ask Snow White to stay. But when the queen learns that her stepdaughter is still alive, she sets a new plan in motion to destroy Snow White once and for all. Along with being the first of its kind, Snow White and the Seven Dwarfs is also considered one of the greatest animated movies of all-time, and after watching it again all these years later, I can certainly see why; Snow White and the Seven Dwarfs is as amusing and fresh as when it was first made. Aside from the wonderful animation, the movie boasts a number of delightful songs, including such time-honored classics as Some Day My Prince Will Come, Whistle While You Work and Heigh-Ho (all three of which were written by Frank Churchill and Larry Morey). The story itself is also excellent, and features several tense moments to keep viewers on their toes (the showdown between the Wicked Queen and the Dwarfs is a real nail-biter). 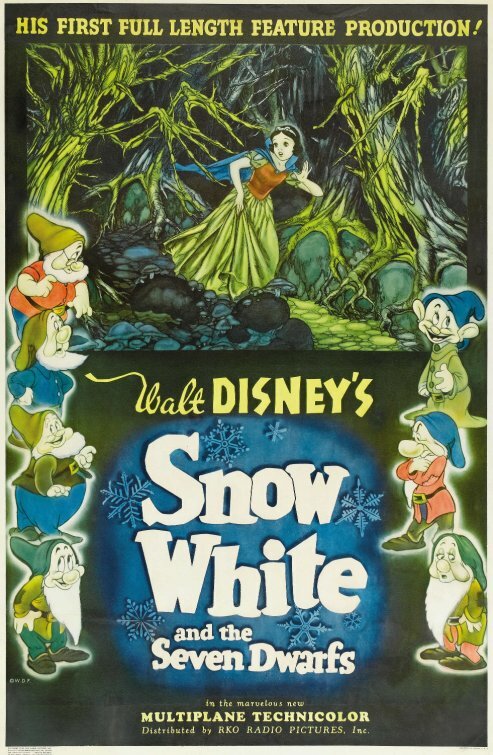 Audiences in 1937 fell in love with Snow White and the Seven Dwarfs, turning it into a box office sensation. 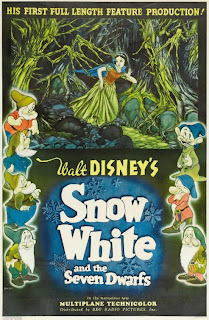 Disney, who had re-mortgaged his house to finish the film, did more here than just make a movie; with Snow White, he launched the beginning of a whole new industry, one that continues to flourish to this day. Oh, this is cool. I need to check out which other movies you've watched! I wonder how much it grossed during its first year. Kristin: Thanks for stopping by, and I'm glad you're enjoying the blog! According to Leonard Maltin's book, "Of Mice and Magic: A History of American Animated Cartoons", the movie made approx. $7.8 million during its initial run, quite a bit for a 1937 film! Thanks for the comment, and take care!